The upsurge in Uber’s ride-sharing service has been resisted all over the world – mostly by licenced taxi interests, fearing the winds of competition would take away passengers. In a show case of the unprecedented power of big data to deliver insights into ‘what’s going on?’ in a market, recently published HoustonKemp analysis shows those fears are misplaced. Following drawn out regulatory and enforcement skirmishes, Uber’s ride-sharing service was finally legalised in New South Wales in late 2015. Since then, would be point to point passengers have been free to choose between a regular taxi or its close substitute, a ride-sharing service. In a recently published study for the NSW Independent Pricing and Regulatory Tribunal, my colleagues Adrian Kemp and Howard Gu analysed millions of payment card transactions, seeking insights into how the point to point passenger transport services market in NSW has changed since the legalisation of ride-sharing services. Their analysis shows dramatic increases in the use of point to point passenger transport services, but little change in the expenditure on rides taken by taxi. In a huge win for passengers, in just 18 months Uber has expanded the market by more than sevenfold – as illustrated below. 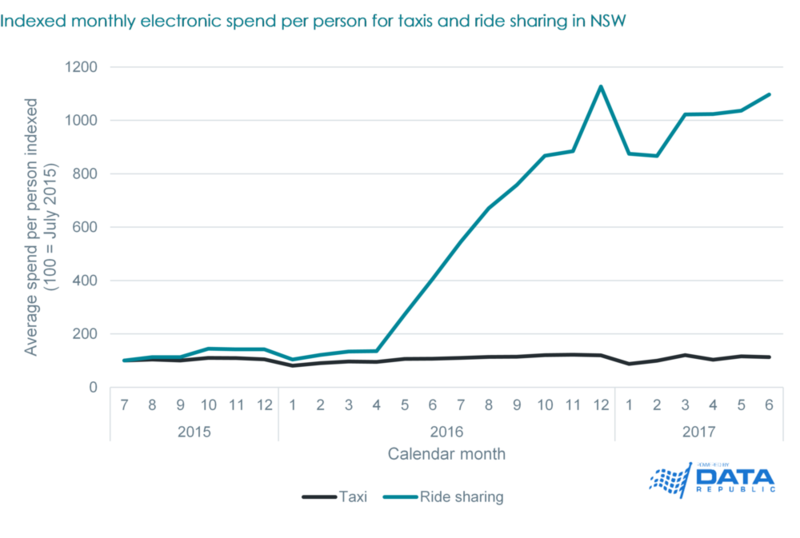 Hundreds of thousands of people in NSW are now opting to use a ride-sharing service on occasions when, before, they would presumably have either walked, caught a bus or train, or perhaps not travelled at all. These extraordinary results underline the huge potential for markets to grow when new services are unleashed, and the enormous benefits to consumers from the ‘disruption’ that is ride-sharing. Posted on January 12, 2018 by Nicole Dann and filed under Articles and tagged Adrian Kemp Howard Gu Greg Houston. Load shedding in South Australia on Wednesday 8 February and successive ‘close shaves’ in NSW and Queensland as the heatwave spread north have exposed serious weaknesses in the national electricity market (NEM). For some time now, it has been fashionable to blame South Australia’s near 40 per cent renewable (wind) generation mix for outages in that state. However, reliability problems in regions with much less renewable generation underlines that the challenges facing the power system are much more complex and extend far beyond South Australia. The NEM’s ‘energy only’ market design means that generators get paid when they are called to run, but not otherwise. It was and remains a fundamentally sound basis for organising generation markets. However, the consequences of some poorly-conceived interventions in that market design are now starting to show. At the time of its instigation, the bi-partisan renewable energy target (RET) seemed straight-forward: mandate that purchasers of wholesale electricity buy an increasing proportion from renewable sources, and impose stiff penalties for non-compliance. Few appreciated that subsidising one form of generation amounted to imposing a tax on all others. Compounded by weak demand growth since 2009, the RET has driven a steady exodus of fossil fuel generators from the market. Some aging, CO2 heavy, coal-fired plants had in any case passed their time and needed to go if carbon reduction targets are to be met. But several much newer, CO2 light, gas-fired plants have also been mothballed – squeezed between high domestic gas prices and electricity market revenues deflated by subsidised wind turbines. These forces have caused the once contemplated role of gas as the ‘transition fuel’ to a much lower carbon generation mix not to materialise, so that we now have a sub-optimal generation portfolio with too few highly reliable, shoulder- and peak-period generators. With the planned closure of the giant 1600 MW Hazelwood plant next month, market rules and operating protocols must be adapted quickly if the past week’s problems are not to be much worse come the summer of 2017/18. 1. The protocols and norms by which market operator AEMO makes decisions need careful review, so that the system is run more conservatively and with greater emphasis on the consequences of ‘getting it wrong’ – for example, in assessing capacity requirements in South Australia, AEMO assumes a contribution towards peak demand from wind of nine per cent, yet when demand was high last Wednesday the weather delivered only half that amount. On its face, a much more cautious approach is needed. 2. Greater caution as to target levels of supply reliability would also assist the case for AEMO invoking its ‘reliability and emergency reserve trader’ powers more frequently and, longer term, for much stronger interconnection between NEM regions. Heatwaves rarely hit all of the south eastern states simultaneously, and providing for greater diversity of supply across regions is critical. 3. The generator playing field must be levelled so that the structural disadvantage imposed by the RET on forms of generation that can be scheduled with very high reliability (eg, fossil-fuelled and solar-thermal units) is eliminated, thereby improving the incentives to invest in this form of capacity. There should be no need to throw out the energy-only market design, but there is opportunity for market-saving innovation, perhaps by introducing a price premium for output from scheduled generation, paid for by a discount on the output from semi-scheduled generators (mostly, wind) that only ‘turn up when they can’. 4. The market price cap should be raised so that it more closely reflects the cost to customers of losing load, and encourages peaking plant to be more available – even if deployed for just a few days per year. For the energy only market design to work as intended, it must not prevent peak period prices from reflecting the high cost of load shedding or non-supply. Ensuring the demand side of the market can see and respond to high price events would also assist energy consumers to make informed choices on peak days. 5. Lastly, the Victorian and NSW governments could assist by easing their moratoria on gas exploration and development, and facilitating arrangements that enable land-owners to share a greater proportion of the potential value of onshore gas reserves. Improved availability would take the pressure off domestic gas prices and strengthen the viability of gas-fired generation. The first four of these measures would all add to the cost of generating and delivering electricity, and so the prices paid by consumers, while the fifth is also far from popular. However, the cost to consumers and the economy as a whole of an unreliable power system is a much higher price to pay. Decarbonising our energy system involves hard choices, and time is running out for those choices to be made. By contrast, generators in Western Australia (not part of the eastern states market) get paid just for being available, and WA consumers now pay a high premium for capacity they do not need. Posted on February 14, 2017 by Nicole Dann and filed under Articles and tagged Greg Houston. The Australian Competition Tribunal has overturned a Ministerial decision – made on the recommendation of the National Competition Council – not to declare the shipping channel and berth services provided at the port of Newcastle. For more information, please click here. Posted on June 3, 2016 by Nicole Dann and filed under Articles and tagged Greg Houston. The Australian Competition Tribunal handed down its decision on the appeals brought by electricity and gas network businesses in New South Wales and Australian Capital Territory against decisions made by the Australian Energy Regulator. This is the Tribunal’s first review of decisions made under new regulatory rules introduced in 2012, as well as the first under the new arrangements for limited merits review. HoustonKemp experts assisted both Networks NSW and ActewAGL prior to and in the course of the Tribunal proceedings. For more information about the Tribunal’s decision, please click here. Posted on February 29, 2016 by Nicole Dann and filed under Articles. Simon Arthur conducted research into the Orakeikorako geothermal system as part of his engineering thesis and was subsequently employed by the University of Auckland Geothermal Institute to co-author his research into a journal paper, recently published in Geothermics. The paper demonstrates that even with limited down-hole data, accurate reservoir models can be developed and calibrated using detailed surface measurements. This is an important finding for modelling other protected geothermal systems and for the early stage assessment of geothermal energy resources. The January 2016 issue of Geothermics can be found here. Posted on February 24, 2016 by Merrilyn Bear and filed under Articles and tagged Simon Arthur. A summary of an article Tom Graham co-authored in 2014 on incorporating marginal costs in water supply tariffs appears in the March 2015 issue of the ACCC quarterly publication, 'Network'. The summary appears in the section titled ‘From the Journals’ that contains summaries of articles, reports and books on subjects relating to the economic regulation of infrastructure. The March 2015 issue of Network can be found here. Posted on April 13, 2015 by Merrilyn Bear and filed under Articles and tagged Tom Graham. Tom Graham co-authored an article that discusses the two main methods for estimating long-run marginal cost in the water and wastewater industry – the Turvey (or ‘perturbation’) approach and Average Incremental Cost approach. The article compares the relative merits of each approach and provides examples of their application across Australia and in England and Wales. The article was published in the September 2014 volume of the Water Utility Management International. Posted on November 21, 2014 by Merrilyn Bear and filed under Articles and tagged Tom Graham.